Hi! I have two 19-week old male brothers who have just started to fight what can I do to stop this? Oh Deana, it sound like you've really got your hands full, doesn't it? Raising two puppies in the same household, (and from the same litter) usually always results in trouble, as I think you're beginning to discover for yourself! Next time your puppies are fighting, try to see if one is 'bullying' the other; is there a more dominant puppy and does the other one always seem to come off worse? The reason I ask is, where there are two puppies being raised together, there's always the potential for the more dominant puppy to 'bully' the other. Walk and exercise each puppy separately and then make time to walk them together. In fact, it's advisable to do everything separately with your puppies for the first year! There are lots of good reasons for this and you can learn more about them and about raising two puppies generally by reading this article. 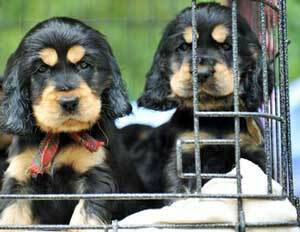 If you follow the advice, persevere, you will raise two very well-mannered, happy spaniels. Hi, have you considered dividing the crate in two using a pieced of strong card or wood, cut to size. Placed in the centre of the crate, that would give you two entrances to two separate 'rooms' within the crate. We have EIGHT puppies from the same litter. I can't afford 8 crates. They are almost 5 weeks. We have 4 black and 4 blonde and it seems the darker ones are more aggressive. How should I separate them as the mama is still nursing? That sound like such a lot of hard work. I'm so pleased I didn't get two puppies now, but I was tempted to when I got my Ben. The extra work makes a lot of sense when you think about it, doesn't it. Did you do any of it and did it work?